Live your best allergy life. 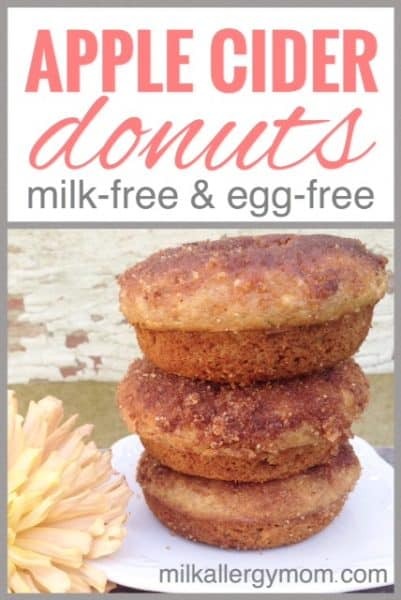 It took us many years, but we finally have a dairy-free and egg-free donut recipe for our food allergy family. Three cheers for donuts! This is his birthday breakfast of choice year after year so you know we are onto something. They are downright addicting! 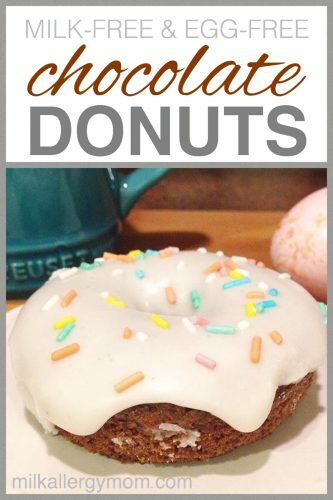 The excellent news is that if you don’t have a donut pan (affiliate), you can easily make these in a muffin tin. That’s what our family used for quite awhile. 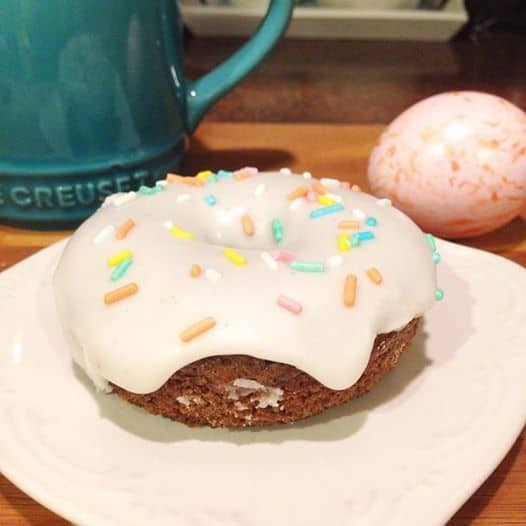 Although, your kids will especially love having “real” donuts with holes at some point. Don’t hold out on them, mom! And the fact that these do not contain yeast and are baked instead of fried are major bonuses in my book. This recipe is adapted from 52 Kitchen Adventures. Enjoy! 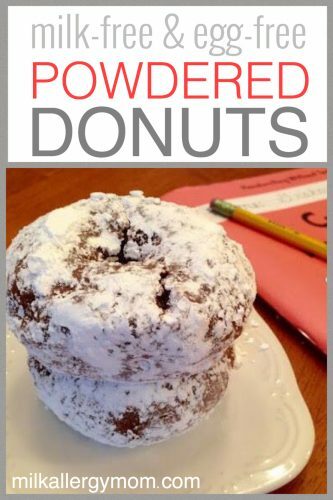 In a large bowl, combine flour, cocoa, baking powder, baking soda. Whisk in sugar, nutmeg and salt. Add in the coconut oil until it becomes coarse crumbs. The Kitchen Aid Mixer (affiliate) is great for this. In a separate bowl, mix together buttermilk, yogurt, vanilla and egg. Pour the wet ingredients into the flour mixture and mix until just combined. Don’t over mix. Use a spoon to fill each mold 1/2 to full. Bake until doughnuts spring back when touched. Start at 15 minutes. In a bowl, whisk powdered sugar and water. Mix until it becomes a thick paste. Add 1/4 teaspoon of milk at a time until it reaches the consistency of a thin glaze. 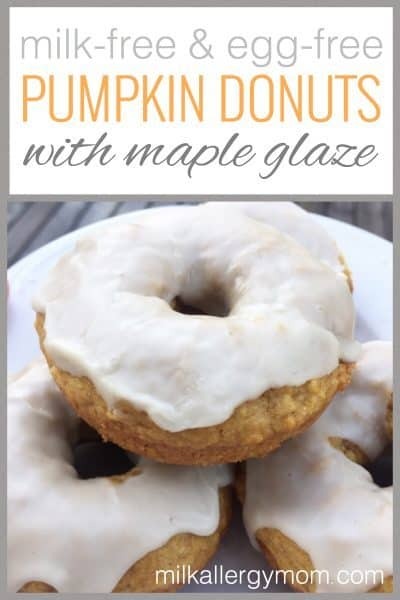 Drizzle onto cooled donuts. Jamie, these look SO yummy. I'm getting hungry and I already ate something this morning. how do you make a hole if you do it in a muffin tin? Heyley, with a muffin pan I don't get holes. Then I did buy a donut pan. Hope that helps! What brand sprinkles do you use? Hi Katie, we usually use the ones on the Pillsbury lids because we are buying the frosting anyways. They contain soy. Hope that helps! I haven’t been able to find dairy free buttermilk. Any suggestions as to where I can get it? Oh this is easy! Just make it yourself with milk and lemon juice or vinegar. 🙂 1 cup dairy-free milk and 1 tablespoon of either white vinegar or lemon juice. And let it sit for 5 minutes. Hope that helps! 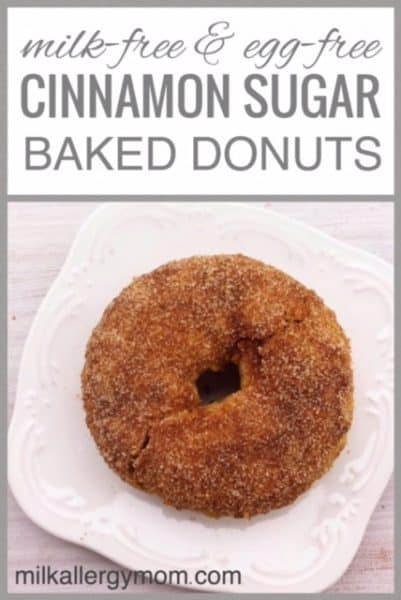 What’s the best way to store them after baking and how long do they last? Thank you! Oh Mary, so glad we could help! Stay cozy! Hello, can I use canola oil instead of coconut oil? Your recipe calls for dairy-free milk but I can’t have any milk at all is there a substitute for the dairy-free milk I can try? There are many dairy-free milk options but perhaps if none work for you, water maaaaaay work. OR canned coconut milk if you’re not allergic.